Best Summer Camping Destinations in West Virginia: 4 Top-Rated Campground to Hit This Summer. 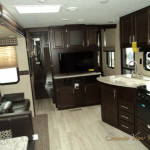 KZ Durango 1500 Fifth Wheel Review: 3 Reasons This is the Best Family RV!! !